Now, frankly, although concerning, the trade deficit does not worry me nearly as much as the national debt that rose to a staggering all-time high of $22 trillion last month. That was the first record he broke. Between the two, the national debt and the trade deficit, it would appear that Trump’s real goal is to bankrupt the United States of America. Is this what he meant by “Make America Great Again”? And worse yet, his blind-faith followers, both in the Congress and among the voters, are still busily applauding him, chanting “Lock her up”, and still waiting for Mexico to pay for the wall that will never be built. Care to know some of what happens when a nation becomes ‘bankrupt’ and cannot pay its debt? In part, domestic savers and investors, anticipating a fall in the value of the local currency, will scramble to withdraw their money from bank accounts and move it out of the country. To avoid bank-runs and precipitous currency depreciation, the government may shut down banks and impose capital controls. As punishment for default, capital markets will either impose punitive borrowing rates or refuse to lend at all. And credit-rating agencies will no doubt warn against investing in the country. That Donald Trump does not understand economics is obvious, but what’s worse, what is unconscionable, is that he refuses to listen to and learn from those who do understand. To add insult to injury, Trump’s Secretary of the Treasury is Steve Mnuchin, an investment banker and former hedge-fund manager. Talk about putting the fox in charge of the hen house!!! Trump’s ignorance is quite frankly costing us … we the taxpayers, We the People. Farmers are filing for bankruptcy because Trump’s tariffs have virtually closed the Chinese market for soybeans and damaged exports of milk and pork. And still, the people are applauding him with their eyes closed and cotton stuffed into their ears. And while our debt increases, while our trade deficits are skyrocketing, while farmers are losing their life savings, Donald Trump wants to spend billions more dollars to build a useless, unneeded wall on our southern border. As I said … it would seem his goal is to take what he, his family, and his rich cronies can get during his four-year term and destroy the rest. The biggest cause of the national debt increase is the tax cuts for the very wealthy that were voted into law in December 2017. If you think of your household budget, it is as if you took a large pay cut, yet still have the same obligations such as mortgage/rent, electricity/gas, car payment, water bill, fuel, food, clothing, etc. You can see where this just doesn’t work. Obviously, Trump cannot see, for apparently he either missed out or slept through Econ 101, and has never had to prepare or maintain a household budget. After all, this is the ‘man’ who thought you had to present identification to buy groceries! That is reminiscent of the time, when my children were small, and I couldn’t afford to buy my son a toy he wanted. He said, “But mommy, you have lots of checks!” Sigh. It simply doesn’t work that way, as most of us who are thinking individuals realize. I could understand that lack of comprehension from my 6-year-old son, but not from a ‘man’ aged 72 who is the leader of a nation of some 300 million people! As long as he can milk it for what it’s worth to him, personally, while he’s in office, he does not care what happens to our economy, our nation, our lives, once he leaves office. I fear that by the time somebody manages to awaken the republicans, remove their blinders and pull the cotton from their ears, it will be too late to avert a full-fledged depression such as the one that began in 1929 and lasted for ten years. Remember back in 2015-2016, that long, ugly, disgusting, tiresome campaign Trump conducted? Yeah, who could forget, right, especially since he doesn’t seem to realize that the 2016 election has ended and the campaign is over, so he keeps holding more and more of his really crappy rallies where he still has his minions chanting “Lock her up!”, even though they have forgotten who it was he wanted locked up. One of the many things that he spent that year-and-a-half (have I mentioned that it was a very looooooong year-and-a-half?) shoving down people’s throats was how he was going to “drain the swamp”, a euphemism for getting rid of corruption in the federal government. Well, we now know, thanks to Kellyanne Conway, that Trump uses a different dictionary, a different vocabulary than we do, called ‘alternative facts’, and that by ‘drain the swamp’, what he really meant was he was planning to bring in much more lethal, corrupt, greedy, criminal gators ‘n crocs. You will remember that last year Congress passed a tax bill that included tax cuts for the wealthy, but did very little for the average wage earner. And the wealthy were happy, for they heard the ‘ka-ching’ of still more money hitting their bank accounts, so they donated some of that money to republican candidates so the republican candidates could buy more air time on national television to stay in office and ultimately give those wealthy people even more advantages. It’s a vicious circle. But apparently the glow of their tax cuts wore off, and now they want even more. And guess what? Trump and his minions want to give it to them! Now, members of Congress are cognizant of the fact that there is an election in less than 100 days, and they don’t want to rock any boats right now by giving the wealthy more money, for they understand that the rest of us also get to vote on November 6th. So, Trump & Co have found a way to do their reverse Robin Hood act without the blessings of Congress, and certainly without the blessings of We The People! The agency is studying whether to allow investment income, known as capital gains, to be adjusted for inflation in a way that shields more of it from taxation. Most capital gains are paid by wealthier Americans, who disproportionately hold large portfolios of investments. When you sell stock, you likely realize either a capital gain or loss, which is the difference between the amount for which you sold it and the amount you initially paid for it. If you paid $1,000 for 25 shares of XYZ stock in the year 2000, and you just sold it for $900, you have a capital loss of $100. Conversely, if you sold that same stock for $1,100, you have a capital gain of $100 which is subject to income taxes. But what Steve Mnuchin, Secretary of the Treasury Department, is suggesting is that the basis, or what you paid for that stock, should be adjusted for inflation in the calculation of capital gains. Thus, it could be argued that the $1,000 you paid in 2000, adjusted for inflation, is equivalent to $1,100, thus wiping out your capital gain and BINGO — you now owe no taxes on that gain! Now, when you consider that for the wealthy those capital gains may be in the millions of dollars, well you can only imagine how much they would save in taxes. You and I won’t benefit more than a few dollars, if that, but people like Donald Trump, Betsy DeVos, and a host of others, stand to save hundreds of thousands in taxes. The wealthiest 1% of American households own 40% of the country’s wealth. That share is higher than it has been at any point since at least 1962, according to a study by economist Edward N. Wolff. Meanwhile, you and I struggle to pay the bills and put food on the table, keep the 10-year-old car running for another year, and cut corners wherever we can. Trump’s policies and the December donor tax cuts have already plunged the nation into deeper debt and increased the deficit. This move further reduces the income without doing a single thing to reduce expenses. And it can all be done without Congressional approval. If you ever had any doubt whether Trump had the good of the nation and its people in mind, this should convince you. Oh … and would you be interested in knowing Steve Mnuchin’s net worth? $400 million. Personally, if this is what Donald Trump means when he says he will “keep fighting for Americans”, I wish he would just stop fighting. The wealthy, under Trump, are having a field day, but eventually, as those of us whose brains have not been replaced with dollar signs know, eventually the party comes to an end. Debts come due and there are very real consequences when there is no money in the treasury to pay those debts. And what about the rising poverty rates in this nation? How do you explain to a poor person that you are cutting their food stamps because the rich people are paying less taxes and, well, sorry but there just isn’t enough money for you to feed your children? That “great economy”, that rise in Gross Domestic Product (GDP) that he keeps bragging about? Guess what, folks … it doesn’t mean a damn thing for the average citizen in the U.S. Sure, unemployment is low, but wages haven’t risen. Many lower income people still have to work 2 or even 3 jobs just to buy food and keep a roof over their heads! But by all means, let us make the wealthy even wealthier. POPLAR BLUFF, Mo. — When a Mexican company bought Mid Continent Nail Corp. in 2012, workers at the factory here feared it was the beginning of the end. Their jobs, they suspected, would be given to lower-paid workers in Mexico, more casualties of the hollowing out of U.S. manufacturing driven in part by an embrace of global trade. Instead, Mid Continent’s factory has doubled in size since Deacero’s purchase. The company, facing fewer restrictions on steel exports after the North American Free Trade Agreement, shipped steel into Missouri, willing to pay skilled workers more to take advantage of cheaper energy costs in the United States and a location that allowed swift delivery to U.S. customers. But … Trump has put 25 percent tariffs on steel imports, bumping production costs and prompting Deacero to reconsider this arrangement. With Mid Continent charging more for nails, orders are down 70 percent from this time a year ago despite a booming construction industry. Company officials say that without relief, the Missouri plant could be out of business by Labor Day — or that remaining production could move to Mexico or another country. The layoffs have already begun. The company now employs fewer than 400 workers, down from about 500 before the tariffs took effect last month. The plant may close its doors by Labour Day. That, folks, is just a month-and-a-half away! We’re not talking about next year, or in three years … we’re talking about NOW. Or consider the case of Harley-Davidson, who will begin shifting production for the EU market to its international facilities rather than raise their prices by as much as 31% if they stayed in the U.S. Typically, when their decision was announced, rather than talk or negotiate, Trump did the only thing he knows how to do: mock and threaten. Such helpful, professional behaviour, eh? Two weeks ago, the CEO of General Motors warned that the company may be forced to cut back production and cut U.S. jobs. And the Alliance of Automobile Manufacturers (AAM), issued an analysis estimating the price of a typical new vehicle sold in the U.S. would rise by about $5,800 as a result of the tariffs. Think about that one … nearly $6,000 more to buy a car! These are but a few examples of the fallout from Trump’s trade tariffs, and the damage is only beginning. The longer the tariffs remain in effect, the more jobs will be lost AND the more we will see the prices of both agricultural and durable goods rise. While I do not wish the loss of a job on anyone, I have to ask: is this what it takes to awaken Trump followers? Do they have to lose their jobs before they begin to see that virtually nothing Trump has done has been in our best interest? Will they finally get it when they awaken one morning and realize they have no job, no health insurance and cannot afford food for the next week, let alone a car to go buy that food or look for another job? Trump’s cabinet were handpicked for their loyalty to Trump, and they received early training in “alternative facts” and “how to spin anything using blatant lies”. Treasury Secretary Steven Mnuchin learned his lessons well, apparently, for he claims U.S. tariffs and China’s retaliatory actions haven’t dented the domestic economy, as he sought to calm fears from Republicans in Congress that a trade war is hurting American consumers and companies. It is time for Trump’s followers to wake up and realize that they are the ones who will be hurt most by his policies regarding education, the environment, foreign policy, and the economy. A number of issues have been forgotten in recent days as we are all concerned with Trump’s horrific behaviour abroad last week, and his apparently slavish adoration of Vladimir Putin, as evidenced in Helsinki on Monday. Trump has been in a whirlwind of tweets and speeches contradicting his own self at every turn, in a foolish attempt to put some favourable spin on his actions, else distract us from them. But we cannot afford to take our eyes off any of the balls: the immigrant children, abuses of power, tariffs, and much more. Friend Gronda has once again done an excellent job bringing us up-to-date on the latest about U.S.-Russian relations, sanctions, etc. Sub-title should be “Putin and his favourite puppet, li’l Donnie”. Please take a moment to read. Thank you, Gronda, for all your hard work on this one. Excellent post. Remember when the republican President Donald Trump recently took what looked like a real stance against Russian oligarchs. I was pleasantly surprised that he had finally taken a tough position for the first time against the country that attacked our US democracy on numerous fronts having to do with our election infrastructure in 2016. In addition this was supposed the send Russia a message that the US was backing our ally Great Britain where two Russian expats were poisoned by Russian agents on UK’s territory. 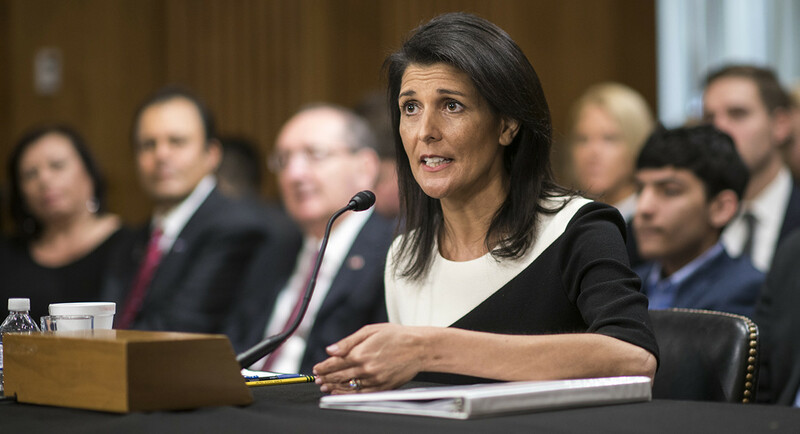 Then very recently, I was beside myself with joy when the US Ambassador for the United Nations Nikki Haley had announced that the US was poised to enact additional sanctions against Russia that would be announced by the US Treasurer Steven Mnuchin on the 16th of April 2018.